Rob Cesternino and Akiva Wienerkur have perfect vision as they recap a Seinfeld episode each week. 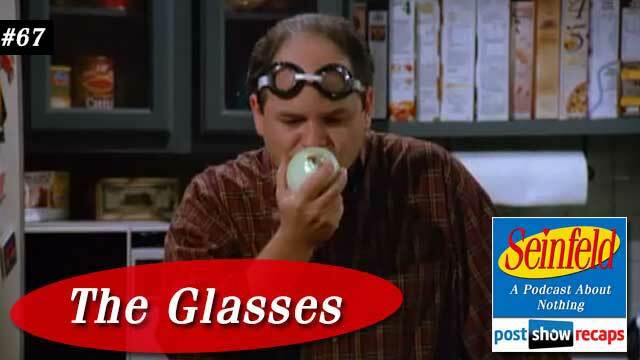 This week, they recap “The Glasses”, which first aired October 7, 1993 as part of season five. The episode was written by Tom Gammill and Max Pross. Rob mentioned how this season saw a big increase on the show’s writing staff. In Seinfeld news, Jerry Seinfeld’s son had his lemonade stand for charity shut down on Long Island. Also, Akiva pointed out that a U2 podcast recently had all four members of the band on it, reminding Rob that their quest to have Jerry and Larry on shouldn’t end. Akiva also wanted to introduce a new segment where he reads a Seinfeld related tweet. This week, noted comedian Kumail Nanjiani tweeted how he is going to start a new podcast called Fear the Seinfeld. Rob brought back the Scene it trivia question after skipping last week. Akiva was correct this week, closing back in on .500 at 4-5. Jerry’s opening stand-up is a bit about how the nighttime persona often makes decisions that adversely effect the daytime persona. The episode opens with Jerry and Elaine staring out Jerry’s window, commenting how they could spit on people from there. Kramer comes in to tell Jerry he’s found the air conditioner her wanted. George comes in wearing goggles because he thinks someone stole his glasses at the gym. Kramer tells George he knows a guy who can get him a discount, just like he did for Jerry with the a/c. At the glasses store with Jerry and Elaine, George is asking them for advice on frames. As Elaine is trying to hurry George along in the process, a man with a dog comes in, but the dog bites her leg when she goes to pet it. George wants to go out and confront the guy, but gets distracted as he thinks he sees Jerry’s new girlfriend kissing his cousin Jeffrey. When he comes back in, Jerry gets the information out of George while Elaine writhes in pain on the floor. After Jerry and Elaine leave to have her leg treated at the hospital, George tries to get his discount, but the guy doesn’t give it to George, but does encourage him to pick a woman’s frame. At the hospital, Elaine is getting bandaged up, while also telling Jerry there is no way George saw Amy kissing Jeffrey. Jerry defends George, saying that he is a great squinter. Elaine is alarmed that the doctor sends her off without getting a rabies shot. At Jerry’s apartment, he is sitting on the couch with Amy, questioning her about her whereabouts yesterday. Akiva thought Jerry didn’t need to be so direct about it. Amy isn’t happy about this jealous side of Jerry, but agrees to go out again, as long as he finally gets an a/c for his apartment. Later on, Jerry is telling George how Amy denied it, questioning George’s credibility. George swears by it, citing his great squinting ability. Jerry is reluctant about this, but George suddenly spots a dime on the floor across the apartment, further confusing Jerry. Elaine comes in, and explains that she took so long to come up because there was a dog in the way. Both Jerry and George warn her that she really should get a rabies shot. Kramer comes in to another big applause. Rob and Akiva both think that the extra long audience ovations will have to come to an end soon. George immediately gets on Kramer’s case for Dwayne not giving him the discount, and Kramer assures him he’ll take care of it. George goes to get an apple out of the refrigerator, but accidentally bites into an onion. He continues to eat it to keep up the rouse that he has no trouble seeing. Kramer tells Jerry he could find out if Amy really was with Jeffrey by taking her to Jeffrey’s apartment when he goes to get the tickets. Back at the eye glass store, Kramer lays into Dwayne about not giving the discount, even taunting him with a candy bar. Dwayne agrees to give the discount to shut Kramer up. When George gets the glasses, he realizes they are lady’s frames, to which Jerry mercilessly makes fun of him. Kramer comes in to Jerry’s with the air conditioner and plops it in the window, though it doesn’t fit. Elaine is sitting at the table, getting increasingly agitated reading about the symptoms of rabies. Kramer tells her how you can die from rabies and she should really get a shot. Rob and Akiva pointed out that this sequence was a bit choppy, especially when Elaine drinks the water and starts foaming. Elaine goes back to the hospital finally to get the shot. She’s back at the apartment cooling off in front of the a/c, telling Jerry she really doesn’t think Amy was canoodling with Jeffrey. She spots the dog who bit her and shouts at the owner, saying she is coming down to talk. Kramer comes in, and when he shuts the door, the a/c unit slips out the window, crashing down on the dog. At the health club, George is helping a blind guy to the locker room, but thinks he sees the guy who stole his glasses. He runs out with the blind guy on his arm, but the guy got on a bus. George notices the blind guy’s glasses, and decides to work a trade so he can get rid of the lady frames. They go back to the optometrist to switch the frames, and while there, the dog and owner come in to find out how to find Elaine and Jerry since the a/c fell on his dog, and George stupidly tells him how to find them. Jerry and Amy go up to Jeffrey’s apartment, but Uncle Leo opens the door. Leo gets the tickets for him, and when he comes back, tells Jerry Jeffrey wanted to say sorry. Jerry assumes it’s because he kissed his girlfriend, but Leo informs him Jeffrey’s sorry that the tickets aren’t that great. He tries to smooth it over, but Amy has had enough. Meanwhile, George is trying to trade back frames with the blind guy because they pinch his nose, but he won’t switch back. George again thinks he sees Amy kissing Jeffrey, but when he puts the glasses on, realizes it’s a lady cop kissing a horse. In the final scene at the health club, George complains about the glasses pinching, and the camera pans up to show his original glasses sitting on top of the lockers. Jerry’s closing stand-up is a bit about glasses becoming more fashionable. In 2015, there wasn’t much that would change about the episode, other than looking to see if Amy and Jeffrey were friends on Facebook. 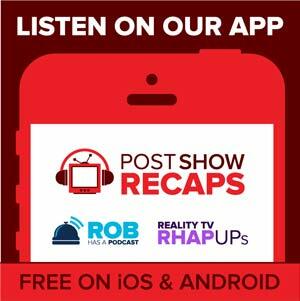 Both Akiva and Rob felt this wasn’t a bad episode, but far below some they’ve covered recently. Akiva ranked it at 132. There were a few emails this week. First Liz emails to ask why George trusts Kramer to get him a discount. Akiva thought it might be a bit different than Kramer’s idea to get a discount on a flight since he could just ask for the discount. Hunter wondered if Amy and Tim Whatley should be shown together in a potential reunion, tying in the Breaking Bad connection. Johnny De Silveira shared that provisions refer to the condiments accompanying the meats. He also asks if either of them have ever lost something, but it was actually in plain sight. Both have had those moments. Amir shared how Elaine has come full circle about dogs, going from wanting to pet one, to plotting a dog-napping scheme with Newman. Finally, Chester thought this episode should have been named differently. He also asks why George would still be wearing the goggles days later. Lastly, he wondered why the a/c didn’t come in a box. Rob and Akiva concluded it must have been stolen. Tune in next week as the guys will breakdown “The Sniffing Accountant”. Send in your questions by emailing [email protected] . Don’t forget to subscribe to the podcast by going to postshowrecaps.com/seinfeldITunes where you can rate and review the podcast. You can get a discussion going about the podcast by leaving a comment on the show page, and as always, you can follow them on Twitter @robcesternino and @keev26. Thanks to Mike Moore for the episode recap.